Weimaraners are members of the sporting dog group, a shorthaired, floppy-eared hunting dog best known for its distinctive silvery grey coat. The unusual color, along with the breed's stealth in the hunting field, leads to the nickname "The Grey Ghost." The breed has also gained popularity through photographer William Wegman's photos, books, and short films. The Weimaraner is a versatile hunting dog developed to find birds, point and retrieve game to the hunter. They have webbed feet and are excellent swimmers. The breed originated in Germany and the Duke of Weimar is generally credited with creating the breed as it looks today, thus the breed' name. The Weimaraner Club of Germany was formed in 1897 and the first breed standard written in 1935, included a detailed description on exactly how the breed should look, including size, coat type and temperament. The breed was, and still is, highly regulated in Germany. These dogs have to pass strict hunting, tracking and conformation tests before they can be bred. A conformation test involves the dog being critically judged against the breed standard to see how closely it matches the ideal standard. Weimaraners are large dogs weighing about 70 to 90 pounds for males and 55 to 75 pounds for females. Males are between 25 and 27 inches tall and females 23 to 25 inches. A healthy Weimaraner can live about 10 to 13 years. They require minimal grooming but can shed quite a bit despite their short fur. Weimaraner shedding will vary from dog to dog based on their diet and they climate they live in. German Weimaraner enthusiasts were reluctant to allow their dogs to be imported into the United States. An avid hunter named Howard Knight, who had worked for several years with the German breed club, brought the first stock into the United States in the late 1930s. The breed's popularity grew with its reputation as an excellent hunting dog. In the 1950s, President Eisenhower, Grace Kelley, and Roy Rogers owned this breed. The most striking aspect of the breed is the unique grey color. The official color is simply called grey, but there are variations within individual dogs that range from a darker mouse grey to a light silver. The nose and toes are the same color as the coat. Weimaraner puppies are born with dark grey tiger stripes that fade a few days later. It is one of the few breeds where this occurs. Long coats have been part of the history of this breed since its creation in Germany where shaggy members of the breed are perfectly acceptable. Only in the United States are long-coated Weimaraners banned from the show ring. They are purebred, just a little hairier. 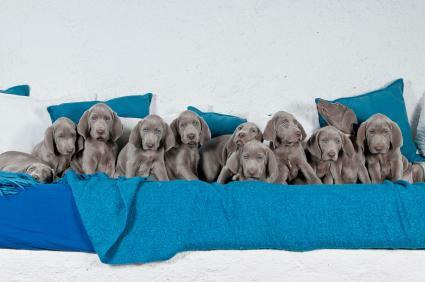 Some Weimaraners are a dark iron blue color, which is not acceptable by the WCA. Blue-colored Weimaraners are not allowed to compete in conformation dog shows but can participate in obedience, agility, and hunting tests. The issue of blue coat color is a source of controversy with breeders participating in conformation shows. Some feel that all blues came from a non-purebred Weimaraner many generations ago, while others consider blue a legitimate genetic color mutation that should be allowed. Blues are purebred, but are not rare or unusual. There are also long-coated types that have long hair similar to an Irish setter . The dog's eye color is also unusual for dogs. Their eyes are grey, gold, or a greenish blue color, not the typical dark brown of most other breeds. Puppies are born with bright blue eyes that gradually change color by the time they are six months old. Grey Ghost owners must keep the dogs active and busy, or else they will find ways to entertain themselves. This breed was created to hunt in the field all day, so its transition to urban life requires a huge commitment by owners to meet their exercise needs. This is not the type of dog content to hang out on the couch and go for an occasional walk. Running (alongside you running, or while biking or horseback riding), swimming, and hiking are excellent activities that help them burn off energy. 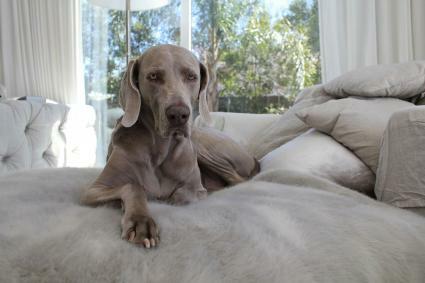 Owners and breeders have a saying that sums it all up: A good Weimaraner is a tired Weimaraner. The dogs are a strong-willed and independent breed and obedience training is a must to establish and maintain a happy relationship. This breed actually does quite well in scent tracking, flyball, agility and hunting tests. Weimaraners are generally friendly, outgoing dogs that enjoy being close to their people. They can do well with some other dogs, especially females, if raised together, but not with smaller dogs or cats due to their hunting instincts. Weimaraners are extremely smart and excel at training and their intelligence makes them destructive if they become bored. Due to their intense energy level (they may seem hyper to the average dog owner), they are considered bad choices as a family dog, but in fact they can be excellent family pets in the right setting. They would do best with older, active children with a family that enjoys regular outdoor adventures with their dog. Although they were not bred to be guard dogs, they can be very good at alerting you to suspicious activity and protective in that their large, fearless "look" will ward off strangers. They are not known for being innately aggressive to strangers but they can be shy and wary of new people. Gastric torsion (bloat) is a potentially fatal condition where the stomach twists. Spinal dysraphism is a neurological condition where puppies are born with a malformed spinal cord. Hip dysplasia is a painful condition affecting the hip joint leading to lameness. Entropion is a condition where the eyelid rolls inside, damaging the cornea. Distichiasis is a disorder where the eyelash grows in the wrong place. Von Willebrand's disease is a bleeding disorder affecting the ability for blood to clot. Hypertrophic osteodystrophy is an inflammation that affects the front limbs of puppies. Hypomyelination (Shaky puppy syndrome) is a condition of a puppy's nervous system involving tremors and lack of coordination. Why Buy From a Professional Breeder? 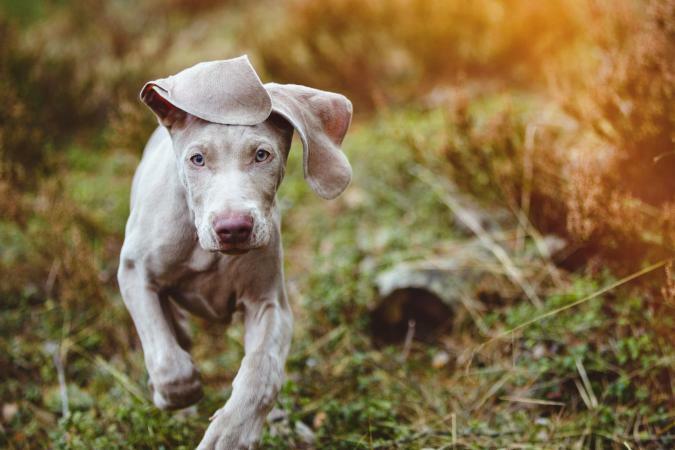 Breeders should be members of a local breed club or the Weimaraner Club of America (WCA) and provide health guarantees and sire and dam's certificates of accomplishment. 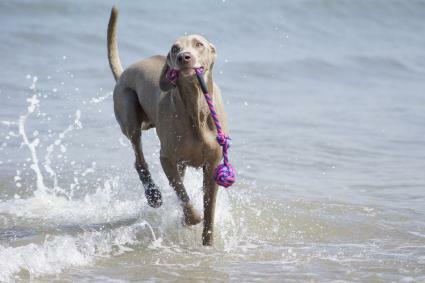 Because these dogs are often too much to handle for many people, Weimaraner rescue is very active. But rescue is an excellent source of finding a wonderful pet that just happened to be in the wrong home. Buying from a reputable breeder is the best way to start off with a healthy, good-tempered companion. Generally healthy, all breeding stock should be tested for hip dysplasia and certified clear of entropian eyelids, an extra set of lashes that irritate the eye. If you're looking for a weimaraner dog for sale, make sure that the breeder has a detailed process for vetting owners of his or her pups and answers all your questions about the breed and their specific breeding practices. You can start your search for a breeder on the WCA or AKC websites or go to dog shows with Weimaraners and talk to their owners for advice and referrals. The average cost of a Weimaraner puppy is $1,500 to $2,000. The Weimaraner price can be significantly higher if the dog's parents have show ring or obedience titles. They are known as one of the smartest breeds of dogs and are called "the dog with a human brain." Their hunting skills are so good that they were used during the Cold War to sniff out missile parts at testing ranges in New Mexico. They are one of the fastest dog breeds, reaching speeds of 35 mph. They are a breed at risk of developing separation anxiety as they do not like to be left alone and can be "velcro" dogs in the home. Weimaraners are known for "nooking" which is a breed-specific behavior. Nooking refers to the kneading behavior on beds, blankets or toys that may also include sucking on soft items. Is This the Right Dog For You? A Weimaraner can be a handsome and intelligent companion who enjoys running and playing just as much as snuggling and being with you. They are wonderful dogs but require an owner who is very active and can handle their intense exercise needs.